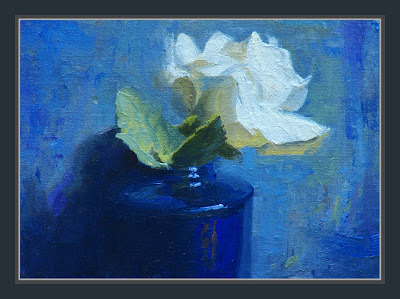 SOLD - White Rose - This piece was a bigger fight than usual. I almost gave up on it several times. Sometimes the struggle pays off, sometimes it doesn't. I am glad I fought through it in the end. Out of curiosity, are you going through the "Blue Period"? Kidding aside, I really like your paintings especially the landscape paintings. I have been following your work for a while now and get such pleasure from it. I hear you about struggles...this one was worth it for sure! Dan, This is exquisite. The texture and the color are amazing. Really lovely! Dan - it was worth the fight. The lost edge of the vase, the lushness of the petals - beautiful! Glad you stuck with it! It is a beautiful painting. I like the texture and color of the background. It plays perfect with the vase. Lovely!! Stunning, the front leaf seems to be in 3-D and jump off the canvas and the vases alone is a work of art! Very beautiful! Also really like the subtle winter tones in the newer post.